It’s the first week of NASCAR’s postseason and the drivers will make their way back to another 1.5-mile track. All of the top drivers in the playoffs will be thrilled and Kevin Harvick and Martin Truex Jr. will be especially happy. Harvick already won at Las Vegas this season and has won three times on 1.5-mile tracks in 2018. He finished in the top 5 in three other attempts, as well. For Truex, the 2017 NASCAR champion already has a win at Kentucky this season and has developed a reputation for getting wins on intermediate tracks. He won at Las Vegas last season, as well. As good as they have been, Brad Keselowski has the hottest hand right now. The 34-year-old has won each of the last two weeks and he finished sixth in Vegas earlier this season. He also has five top-10 finishes and three top-5’s on 1.5-mile tracks this season. He is our pick to win the South Point 400. The race can be seen on NBCSN at 3 p.m. ET Sunday. What are the betting odds for Las Vegas? Which NASCAR drivers are best for fantasy lineup at Las Vegas? 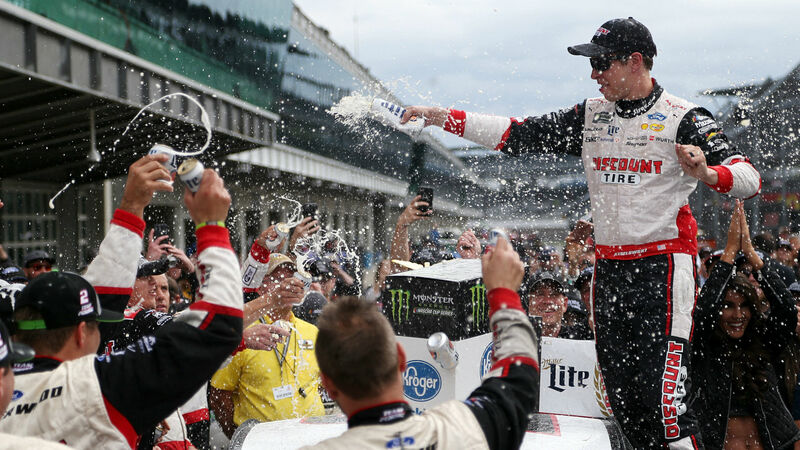 It might seem a little obvious to pick Erik Jones to compete well here with 15/1 odds to win this week. The 22-year-old has five top 10s in seven similar races this season and six top 11s. He also finished eighth at Las Vegas earlier this season. Joey Logano is also 15/1 to win and for good reason. With four top-7 finishes on 1.5-mile tracks and four in his last five races at Las Vegas Motor Speedway, Logano should be looking to get a leg up on his competition in the first leg of NASCAR’s playoffs. Paul Menard never seems to get a lot of attention, but he always drives well on intermediate tracks. He finished ninth in Las Vegas earlier this year, has two top 10s on 1.5-mile tracks this season and finished lower than 14th just once on seven intermediate tracks. Add that to four top-10 finishes in his last seven tries at Las Vegas and he could be near the top of the leaderboard again. News broke this week that Jamie McMurray would be out of the No. 1 car next year, so he has a limited time to show off in that vehicle. Las Vegas is a good place for him to do it since he has finished lower than 16th just once in his last six attempts in Nevada and has finished in the top 12 twice. He also has two top-10 results on 1.5-mile tracks in 2018, along with another 12th place.